How do you store a lot of earrings in a limited space? Let's look at two options - with more coming in the next post. The EarringMaster shown above has 3,582 perforations, and can be used to hold everything from posts to dangles. 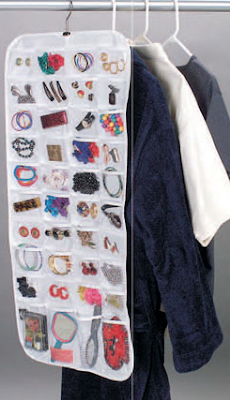 Or you could use this 80-pocket jewelry organizer, which could be used for more than earrings. I've shown one of these before, and it's been noted that this is something you could make yourself, if you are handy. And the EarringMaster shown above fits into this category, too. If you would like to buy one, here's a simple, attractive option from Paradise Hill Designs. And most of the products from this Etsy seller are made from "beautifully aged reclaimed pine." This earring holder, the InView, comes from Hawaii. It has a see-through mesh screen and a mirror-backed shadow box. 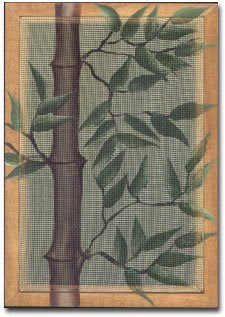 There are a number of framing options, and you can get it with a plain mirror or an "island design." This one is on a stand, but I imagine they would normally be hung on the wall. Update on July 29, 2010: It seems this product is no longer available. 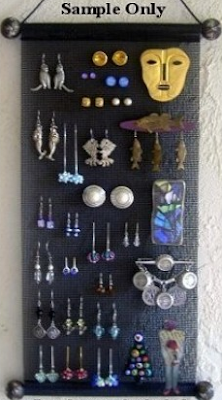 Earring Holder Gallery has lots of designs, too. This earring holder, from Glasswear Studio on Etsy, is sort of a scroll; it comes in white or black with different colored beads. 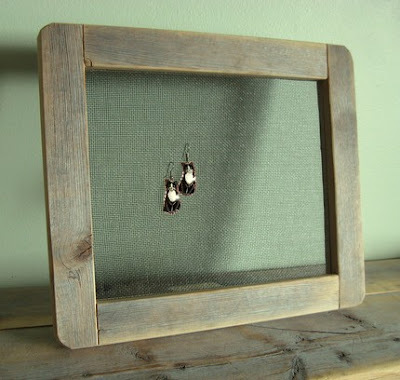 And in a variation on the theme, this woman uses a fabric placemat, tacked to the wall, as her earring holder. I was just trying to clean out my closet last night and realized for the umpteenth time that I could really use one of those light fixtures you suggested for me. This new jewelry organizer will go in that dark closet, so it has finally pushed me over the edge to order the light, too. Cynthia, the person whose question prompted this post just bought an 80-pocket organizer from the Container Store, and she is thrilled with it. I have something similar to the 80 pocket organizer with pockets on both sides (possibly from organize dot com, which has frequent sales or lower shipping, often around holidays) and love it. Necklaces together, watches together... I know where to look for everything. I often hang my robe or a heavy piece of clothing over it to camoflauge it. My biggest complaint is that small post ear rings don't show up well, so will look into the screens you showed. I actually have 2, but only use 3 sides for jewelry (still need to declutter a few pieces). I've found that nail polish, remover, nail files, etc., fit easily in the pockets and use one side for those. The long or wide pockets are good for reading glasses. Could you repeat the link to the light that Cynthia referred to? Lee, thanks for sharing your success story. It seems like the 80-pocket organizer (in its many variations) is a winner. I think the light I mentioned to Cynthia was the Stick Up Bulb (warning - annoying audio), available on that web site and here. Cheap too! Made by Harriet Carter and costs only $9.98. Thanks for adding the caution, Bethany. And I'm glad you like the blog!